Home Island Life Joaquin Forecast Track Trends Farther Offshore From N.J.
Joaquin Forecast Track Trends Farther Offshore From N.J. 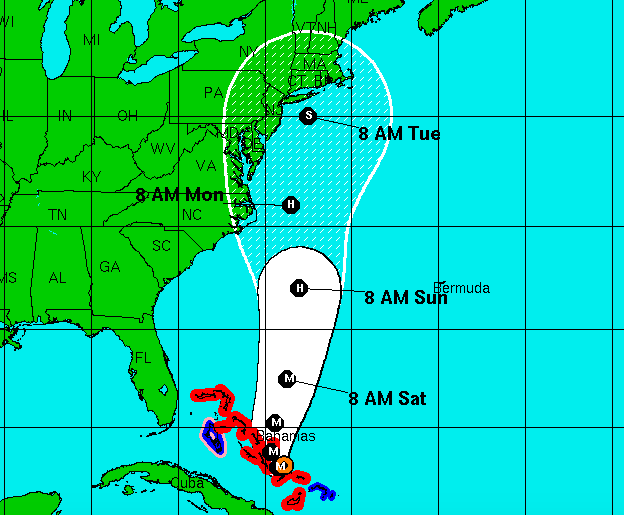 Forecasts released Thursday show Hurricane Joaquin passing farther and farther offshore from New Jersey, trending toward an easterly track that would allow the Garden State to avoid a direct landfall of the storm, though predictions remain fluid and even an offshore pass could spell flooding and torrential rain for coastal area. An update released at 11 a.m. by the National Hurricane Center shows Joaquin passing the central New Jersey coast around 8 a.m. Tuesday. The storm would then continue on a path toward New England. The easterly track differs significantly from changes made to the official forecast on Wednesday, which brought the storm further west. According to the current forecast track, Joaquin would pass off the coast of New Jersey as a strong tropical storm with winds of 70 m.p.h., just shy of hurricane strength. At 11 a.m. Thursday, Joaquin was packing 125 m.p.h. winds and was located about 80 miles south-southeast of San Salvador. A hurricane watch for the U.S. coast would likely not occur until at least Friday morning.